Puerto Rico is in the path of a powerful new hurricane, and it couldn't come at a worse time for the broke U.S. territory. Hurricane Irma -- now a Category 5 storm with 185 mph winds -- could slam into Puerto Rico by mid-Wednesday as it rips through the northeastern Caribbean, according to forecasts. The island has been bracing for impact for the past several days and Gov. Ricardo Rosselló declared a state of emergency Monday. But the threat of a natural disaster comes as the territory deals with a massive economic one. Puerto Rico has been watching its economy decline for years because of enormous government overspending, a big dependence on debt and a costly, inefficient energy system. Those problems finally led the commonwealth in May to file the biggest municipal bankruptcy in U.S. history. 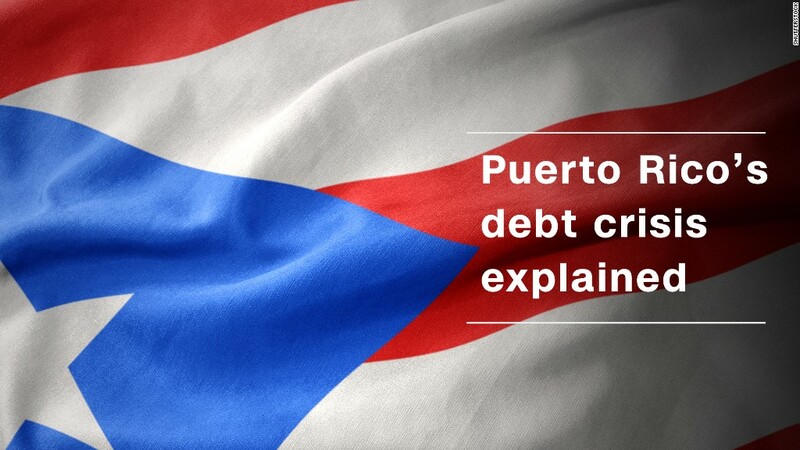 Puerto Rico has $74 billion in debt, and another $50 billion in pension obligations on the books. The island claims it has money ready in case of emergency. Rosselló said Monday that despite its economic challenges, Puerto Rico's budget contains an approved $15 million available as an emergency fund, according to a news release. Puerto Rican officials did not respond to questions from CNNMoney about its disaster funding. And the cost of recovery will likely come with significant federal help. The Federal Emergency Management Agency already has about 400 people in Puerto Rico and the U.S. Virgin Islands to help with hurricane preparation and response, said John Rabin, FEMA's acting regional administrator there. "Right now, the concept of cost has not come up with Puerto Rico," Rabin said. He said a disaster declaration, which would open the door for federal aid, could come days or even weeks after Irma blows though the region. Rabin added that FEMA is working with Congress to put more money in its Disaster Relief Fund so that the agency has the funds necessary to help. Ted Hampton, an analyst at Moody's who covers Puerto Rican bonds, said he has no reason to doubt that aid will come. "I don't think that the commonwealth's well-known economic and fiscal struggles would undermine its ability to secure the aid that it deserves in the aftermath of a major storm," he said. But a powerful hurricane like Irma could still harm Puerto Rico in other ways. Hampton said that a severe disaster could exacerbate some of the commonwealth's adverse economic trends, including migration to the U.S. mainland. The island's population has dropped 10% since 2007, in part because of a lack of jobs. Many professionals have been fleeing to the U.S.
"Puerto Rico is struggling, and it's possible that this storm will add to its economic difficulties," Hampton said. "It could leave a lingering economic mark, even with the availability of federal relief funds." The loss of workers could potentially contribute to other problems as Irma approaches. Residents told CNN affiliate WAPA that they were worried the storm might knock the power out for weeks or months. The director of Puerto Rico's power utility, Ricardo Ramos Rodríguez, recently said that several factors have made the island's electric system "vulnerable and fragile," WAPA reported. Among those issues: an employee shortage. Rodríguez said that many workers recently retired or left their jobs for better prospects on the U.S. mainland. -- CNN's Nicole Chavez and Jason Hanna contributed to this story.